Pine Rim Publishing, founded in 1993, has provided western history enthusiast with well researched, well documented accounts of some of the most interesting historical events in Arizona and Montana. Now, in our twenty-fifth year, our location and attention has moved to New England where recorded history spans nearly 400 years. 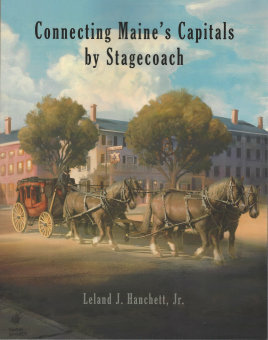 Our newest release, "Connecting Maine's Capitals by Stagecoach" is in inventory and ready for immediate shipping. Please take a look at our "Products" section for more information on this exciting addition to our library, and hopefully yours! Purchases through our website using Paypal are simple and secure. You do not need a Paypal account. Simply pay through Paypal with any major credit card. Kennebec Historical Society, Augusta, Maine.